As many geeks doing some unique things and tweaking their PC by installing different operating systems, and some other people installing the two operating systems on a single PC, this is known as the dual boot or dual boot laptop & PC. If you’re regular visitor of us, then you already tried our previous guide which is to dual boot Windows 10 and Android Marshmallow 6.0 [Android-x86] in this tutorial we did partition windows 10 with the Android Marshmallow. If you haven’t read this tutorial, then go and read it now. Otherwise, you can continue with the current tutorial How To Install Android Nougat 7.0 On PC HDD. 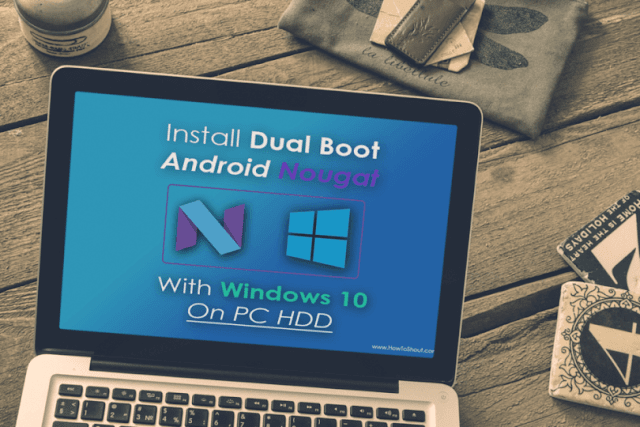 Well, today I came here with same interesting thing feeling excited so today we’re going to share a tutorial which helps you to install latest Android Nougat 7.0 along with Windows 10, or you can say Windows 10 boot Android Nougat. After a long time, Android-x86 launched the most recent version of its project i.e. Android Nougat versions, from now, you’ll able to enjoy the feel of Android Nougat which currently available on few devices like in Nokia 6 and Google Pixel, and you can install Android N in Windows 10 means dual boot. Note: Sorry, this tutorial will work for only on Non- EFI laptops and desktops, so those PC./Laptops which are UEFI enable this guide is not working on these PC. It’s necessary that you must have Low-End or High-End PC Legacy BIOS which is non-UEFI. There are tons of methods to run Android on PC HDD by using an emulator, ADB, Remix OS ….. etc. but we’ve something different from other We provide the Android Nougat.iso file developed by the Android-x86 developer. Download millions of Android Apps and Games from Marketplaces. Well, guys in this tutorial we’ll teach you two parts of installing Android Nougat 7. On PC first one is installing Android N on PC only means single and second one is installed Android Nougat alongside Windows means create partition Windows 10 with Android N partition. You need just to follow each step of this guide then you’ll enjoy the feel and millions of Android apps on your Windows 7/8.1/10 PC. After finishing the process, You need to create a new partition for Android Nougat and have minimum 16GB storage and format it as FAT32 file system. Now boot from the USB flash drive as you usually do for booting. Now Select Yes to Create Read/Write enabled system directory. You’ve successfully installed Android N 7.0 on your PC HDD. Can I Run Android Nougat On PC by Installing Remix OS?